The Society of Breast Imaging (SBI) and Oxford University Press (OUP) are pleased to announce their partnership to publish Journal of Breast Imaging (JBI), the first peer-reviewed journal to focus solely on breast imaging. 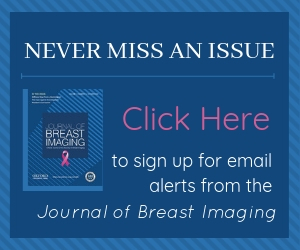 JBI is a peer-reviewed publication that aims to provide high quality, evidence-based content for the global breast imaging medical community. The journal seeks to advance the field of breast imaging, with particular focus on improving patient care and outcomes. JBI will publish original research, as well as reviews of important scientific, educational, and clinical topics. The journal will provide a focused platform to disseminate scholarly work, as well as practical articles on breast cancer screening, clinical practice aspects of breast imaging, and educational opportunities, with the goal of advancing the global field of breast imaging for the betterment of patient care. SBI is now accepting manuscripts for consideration to the Journal of Breast Imaging. All JBI submissions are peer-reviewed and acceptance is not guaranteed. Submissions should be made through JBI’s ScholarOne site at https://mc.manuscriptcentral.com/jbri. You must register in order to submit a manuscript. Please follow the instructions to “create an account” which will require you to include or register for an ORCID ID. Please read our Instructions for Authors on the Submit a New Manuscript page before submitting your work. JBI has a streamlined process designed to avoid unnecessary work when submitting a manuscript. Manuscripts can be submitted in any common document format that can be easily opened and read by others. A single PDF or Word file is usually reliable. At first submission, it is not necessary to apply formatting to match journal style. Instead, simply ask: would I enjoy reading and reviewing a manuscript formatted in this way? You will still need to comply with the requirements and limitations of the selected article type, such as word count or maximum references, and ensure your figures are of sufficient quality to allow effective peer review. If you have any questions or need assistance during the submission process, please contact James Butler, Managing Editor, at jbreim.editorialoffice@oup.com or 919-650-1459. We hope you will consider publishing your work in JBI. Your knowledge and expertise as a breast imaging radiologist will contribute to the advancement of our specialty and be a service to your colleagues. If you would like to be considered to peer review submissions to JBI, please contact the editorial office at jbreim.editorialoffice@oup.com.